It was a glorious day in MN today. It was sunny with temps in the low 80s and low humidity. In the words of Bruce Almighty it was a "B-E-A-utiful day". As I was heading to the grocery store, the local nursery was setting up their flowers. I'm always hesitant to plant my flowers this early as I lost most of my flowers to a frost the first year we moved here. Seeing all those pretty flowers this morning had me tempted to try again. I did resist temptation, but I decided to stamp with some of the colors I saw in those flowers. For this month's Color Inspiration Challenge, the colors are: Perfect Plum, Sahara Sand, Always Artichoke and Pink Pirouette. 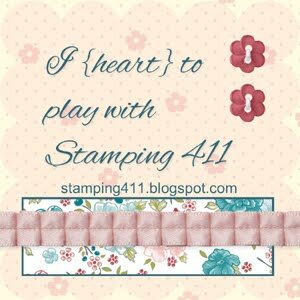 For my card, I chose to play with two stamp sets that have been neglected lately. They're called Nature Walk and Delicate Doilies. The doilies were used to create custom background paper, and Nature Walk was used for my focal image. 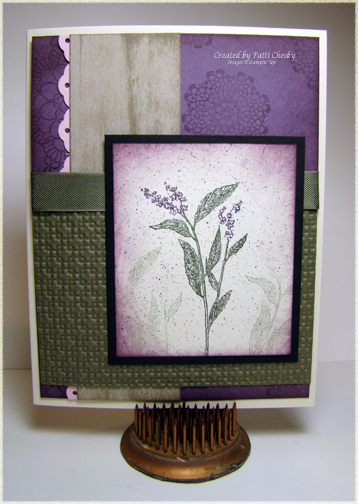 I used a variety of products to create texture on my card. I used the Direct-to-Paper technique on the Sahara Sand cardstock strip, sponging on the Perfect Plum cardstock, and finally, I used the Square Lattice impressions folder on the Always Artichoke cardstock. Each has a different effect that adds up to one beautiful card! 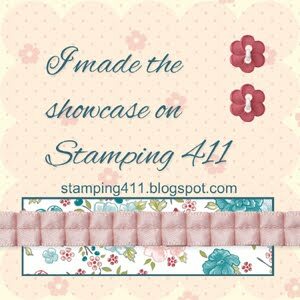 My Pink Pirouette scallops were created using the retiring Eyelet Ribbon Border punch. I just let a little bit of it peek from the side of the Sahara Sand strip. I'll leave you with the card recipe in case you want to re-create it! Are you ready to make a project using these colors? I'll put a Linky Tool at the bottom of this post so you can link your project to our blog. Have fun creating!!!! This is another beautiful card that you have come up with. I love these colors, I think I'll give the challenge a try. And the textures on your card add so much richness. I hate to see the eyelet border punch go, it has been one of my favorites, my go to punch for borders. Thanks for all the work you do to make this site so amazing. Love these colors. Tried to "play along" but the card took a different life! Check my post on Sunday if you're interested! I"ll work on these colors later! Have a great day!